Looking east at Interstate 44 from within the cloverstack interchange at I-270 in Sunset Hills. Photo taken May 3, 2012. When the Stan Musial Veterans Memorial Bridge opened to traffic on February 9, 2014, Interstate 70 was relocated from the Poplar Street Bridge and its alignment north from Downtown. This coincided with an extension of Interstate 44 northward from the Poplar Street Bridge west end to the new cable-stayed bridge at Tucker Boulevard. 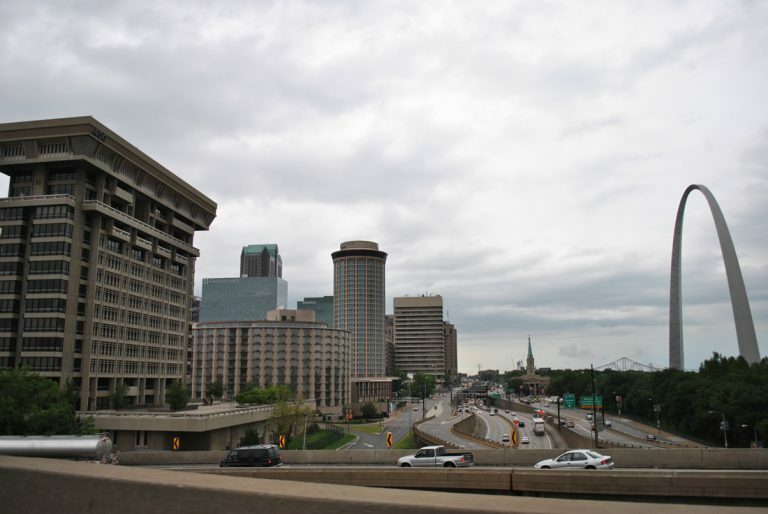 Interstate 44 overtook the trenched freeway of former I-70 leading north from the Poplar Street Bridge by Downtown St. Louis. The northward extension of I-44 was approved by AASHTO on October 21, 2013. Photo taken May 4, 2012. Groundbreaking took place on August 2, 2013 on construction of a lid (Park Over the Highway) above the below-grade section of Interstate 44 (old I-70) between Old Courthouse and the Gateway Arch. Included in the work was the MoDOT project to add new ramps from I-44 east to Lumiere Place Boulevard (former Memorial Drive) for the Eads Bridge, and from Memorial Drive south to I-44 west. These ramps replaced preexisting ramps in the opposite direction. A Texas style U-turn ramp was also added from Exit 292 on I-44 east to Memorial Drive south by Washington Avenue as well. Further north at the Martin Luther King Bridge, separate sections of North 3rd Street were linked at the west end of the bridge. The I-44 east ramp to the MLK Bridge was expanded to include access to Convention Plaza west. The project was planned for completion on October 28, 2015, the 50th anniversary of the Gateway Arch. 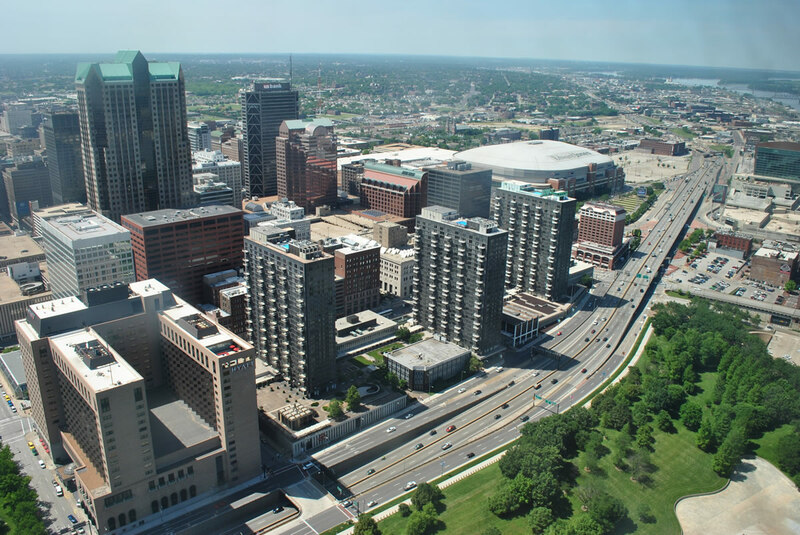 Other Downtown St. Louis area work underway through summer 2017 was the Poplar Street Ramp project, which focused on the interchange between Interstates 44, 55, 64 and U.S. 40. The outdated exchange was updated to remove the ramp from I-44 west to the Poplar Street Bridge (PSB) east. Ramps from the PSB west to I-44 east and I-44 west & 55 south were also replaced with two-lane flyovers. The I-44 east & 55 north ramp onto the PSB was upgraded to two lanes. Work commenced on May 27, 2014 with the closure of the ramp from the PSB west to I-44 east. 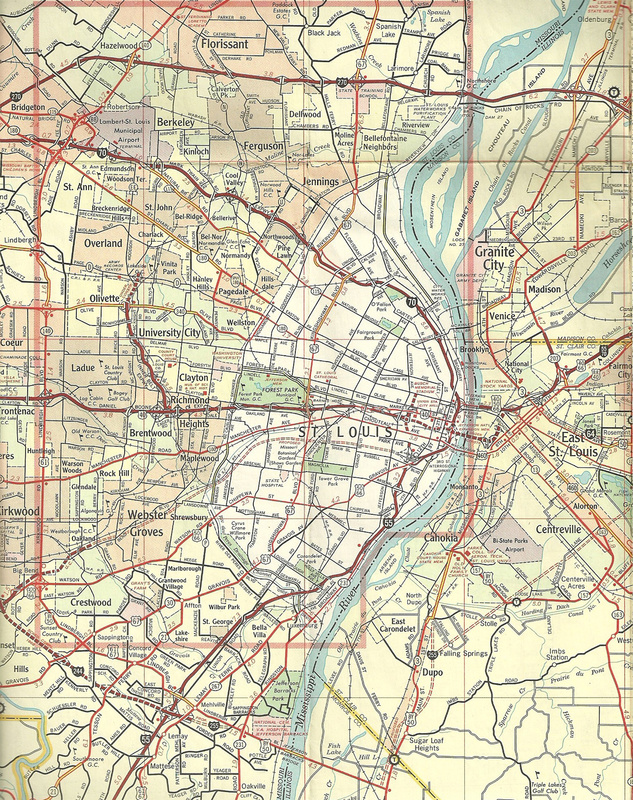 1967 map showing Interstate 44 as a proposed roadway from Webster Groves to the North South Distributor Freeway (Missouri 755) interchange with Interstate 55 in St. Louis. 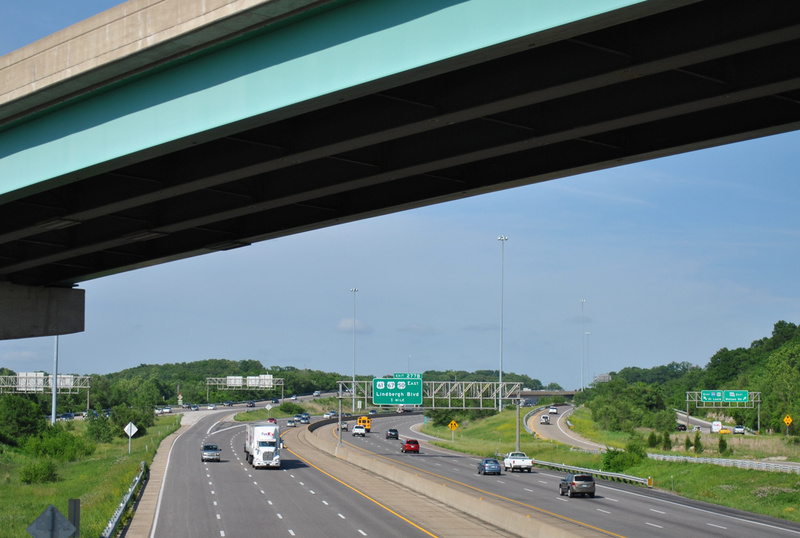 Interstate 44 was the last of the original two-digit Interstates to be completed through the St. Louis metropolitan area (I-64 was not extended west onto U.S. 40 until 1987). Lafayette Avenue connects the off-ramp (Exit 288) from I-44 west with Grand Boulevard at The Gate District neighborhood in St. Louis. Photo taken 05/07/18. Grand Boulevard south at Interstate 44 east and the Compton Heights neighborhood in St. Louis. Photo taken 05/07/18. Jefferson Avenue south at Interstate 44 and Geyer Avenue in the McKinley Heights neighborhood of St. Louis. Photo taken 05/03/12. Geyer Avenue splits with the eastbound on-ramp to Interstate 44 after Jefferson Avenue. Photo taken 05/03/12. Missouri 30 (Gravois Avenue) concludes a 52.7 mile route at the south split of I-44 and I-55 and the LaSalle Park neighborhood in St. Louis. A loop ramp connects I-44 west with Gravois Avenue (Historic U.S. 66) west. Photo taken 05/07/18. "TWO-MILE STRETCH IN ST. CHARLES PAVED WAY FOR AMERICA&apos;S INTERSTATE SYSTEM - HIGHWAYS SHORTENED DRIVES BUT WEAKENED CITIES." St. Louis Post-Dispatch, December 14, 2003.